Being Eco-friendly is so important right now and should be from here on in. We should be concerned about Mother Nature's health even with our weddings. 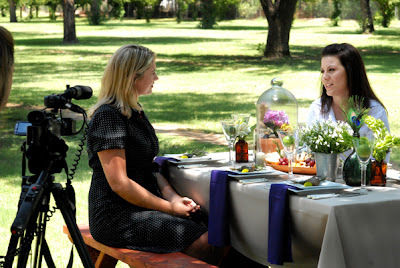 I recently did a TV News Spot with Channel 12's morning show about bringing Eco to Weddings. Check it out the article here and watch us in action here. Remember you don't have to go completely "green" but maybe incorporate at least one aspect of it to do a little damage control. If you need or want more ideas feel free to shoot me an email. I would be happy to provide more suggestions. Thanks to all the vendors that helped out! 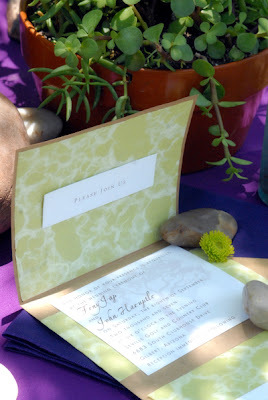 Try using river rock for eco-friendly place cards. Also notice the lovely linen and rentals provided by Tri-Rentals. Thanks Deb! 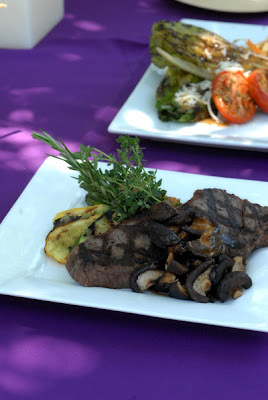 The shoot was taped at The Farm at South Mountain where Santa Barbara Catering provided the local organic food. Thanks Chef, Kim & Jen! 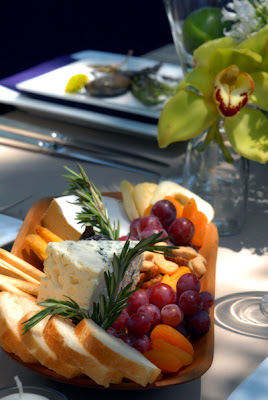 We used a fruit and cheese platter with our floral for that extra splash of color and it gave the guests something to snack on before you will make your grand entrance. This stunning dress was handmade by Jewel Couture. 100% all natural silk (expect for buttons & zipper...come on) Beautiful, isn't it? Invitation was made up of recycled paper and with no inserts. 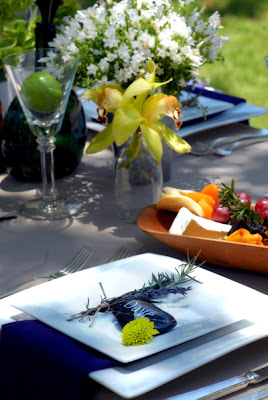 Have your guests RSVP on a website! Thanks to Rhonda Lewis Photography for snaping away. Thanks to Jen Vogel of Channel 12 for taking the time to learn about how we all can make a difference.